Donald Van Slyke (center) working in P.A.T. 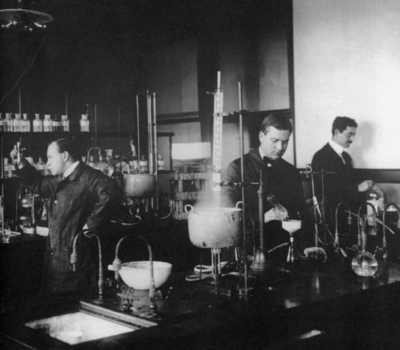 Levene’s Founder’s Hall chemistry laboratory, 1908. Donald D. Van Slyke (1883-1971) pioneered chemical techniques that allowed physicians, for the first time, to analyze blood samples quantitatively in order to diagnose disease and monitor disease progress. In the late 19-teens, he invented an apparatus to measure oxygen and carbon dioxide in the blood. With this device, he could detect acidosis—an accumulation of acid in the blood—in patients at the Rockefeller Hospital with diabetes, before fatal clinical symptoms developed. Later, Van Slyke's interest in quantifying blood gases, as well as substances in other body fluids, led him to study the changes in metabolism, blood chemistry, and urine excretion that characterize kidney diseases. Although he was a chemist, and not an MD, with the hospital's medical staff he oversaw the care of hundreds of kidney patients at the Rockefeller Hospital in the 1930s and 1940s. Van Slyke's quantitative techniques were widely adopted, and the so-called Van Slyke apparatus became standard equipment in clinical and research laboratories before electronic instruments such as spectrophotometers were available. Beyond clinical research, Van Slyke's many contributions to understanding the physiology of blood and of kidney function in health and disease include: quantification gas and electrolyte equilibria in blood, as well as the organic and inorganic constituents of blood; a physicochemical description of the role of hemoglobin in oxygen and carbon dioxide transport in blood; quantification of blood chlorides, urea, and ketone bodies in blood and urine; studies of the metabolism of proteins and amino acids; and discovery of a new amino acid, hydroxylysine.